Drag racing is all about wringing the maximum acceleration out of the car. Basically a proper drag race tournament consists of a series of two-car eliminations in an all-out acceleration contest from a standing start between two vehicles over an exact distance at a special drag racing track. 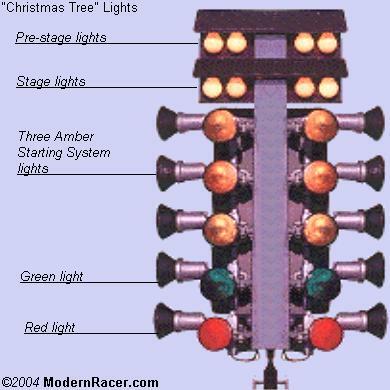 Drag racing facilities are outfitted with "Christmas Tree" lights, and the standard distance is usually either a quarter-mile (1,320 feet) or an eighth-mile (666 feet). Competing vehicles are divided into a variety of classes, with specific rules that determine eligibility based on type of car and modifications allowed. In addition to the regular "heads-up" races where both cars start off together, there are also handicapped races, known as "E.T. Bracket Racing," where two vehicles of varying performance can race on a potentially even basis. The anticipated elapsed times for each vehicle are compared, with the slower car receiving a head start equal to the difference of the two. With this system, any two vehicles can be paired in a competitive race. In professional category racing, the "Christmas Tree" lights control the most important aspect of the race-the launch. The first row of yellow lights warns drivers as they slowly approach the starting line. The second row confirms the "staged" position, which is when the front wheels of the car should be stopped on the starting line as it crosses the staged sensor beam. Then come the "three-amber starting system" lights. In a "pro start," all three amber floodlights in a driver's lane flash almost simultaneously before the green light comes on. In a regular handicap race, drivers get a countdown of one amber light at a time until the green light comes on. The pro start system runs with a 0.4-second difference between amber and green lights, while the handicap system runs with a 0.5-second difference between each of the bulbs. As the green light turns on, the race begins and the timer is started. The timer stops only when the car crosses the finish line at the other end of the track, with time and trap speed recorded. If the last red light turns on, the driver is disqualified. This is caused by a car leaving the starting line before the green light comes on, or staging too deep past the starting line. There are techniques to gain an advantage even before the light goes green. Remove all excess weight and loose items, including spare tire, jack, hubcaps, CDs, beer cases and even excess gasoline in the fuel tank. Now deal with your tires. Firstly, dial out any negative camber in your suspension setup, which can be done at any alignment shop if you don't know how. This gives you optimum grip from your tires. Secondly, ditch those 18-inch rims with those stiff low-profile tires, and slap on your old stock 15-inch wheels with high-profile tires. This will absorb the initial jolt when you launch, and reduce tire spin and wheel hop. If you are really serious, you could replace your tires with some drag racing slicks at the strip. Once the starter waves you into the staging area, proceed slowly. If you have street tires, then there is no need to go through the water box—simply drive around it. If you are running slicks, then by all means idle through the water to get the slicks wet. After wetting the tires, pull forward a few feet and do a burnout to warm up your tires. When you pull up at the line for staging, you can try your luck, or your skill, to stage as far into the staged beam as you can. How you stage has a large effect on things like your reaction time and final time. Staging "shallow" means that your car takes more time to pass through the staged light and increases your reaction time, assuming all other variables are constant. However, it lowers your final elapsed time, and increases your trap speed. This is because the timer doesn't start the timer until the tire comes out of the starting line beam. By then, your car is already moving, so you get a slight running start. This only gives you an advantage over your opponent if you are a bit quicker in your reaction time to make up the difference. The thing is, the race is won based on who crosses the finish line first, not your elapsed time. It's possible to have a quicker time and still lose because you were late off the line. Shallow staging also allows for a driver who leaves early or creeps forward a bit before the green light. "Deep" staging puts you at the edge of disqualification, but also a little closer to the finish line, which is always an advantage. If you find that you can't get your reaction time down enough, either because your car is a little jumpy off the line or you are having trouble leaving on that last yellow, deep staging can help. If you have large-diameter front tires, you probably want to deep stage to decrease your rollout. But be aware that if you car has very little ground clearance, pieces of the front bodywork or suspension can also trigger the lights. Be sure that it is really your tire in the staged beam, and not your front chin spoiler. So in conclusion, shallow staging increases your reaction time, reduces your elapsed time and increases trap speed, while being the safe choice for beginners. Deep staging decreases your reaction time, increases elapsed time and reduces the final trap speed, putting you at the edge of disqualification so it should be reserved for experienced racers. That should cover the basics of getting ready for your drag run without heavy modifications to your car. There are more things that people do, like put ice on the air intake and such, but those are touchy subjects. And launching the car is another subject by itself. Just have fun. For as little as $10, you can test your skills at a proper drag strip, while speeding to your heart's content and keeping your behind out of jail.